Oh my goodness! Easter is next Sunday! How is that possible?!? Is this year whizzing by? Or is it just me? Obviously, I need to get myself in gear and get some Easter goodies and cards made. 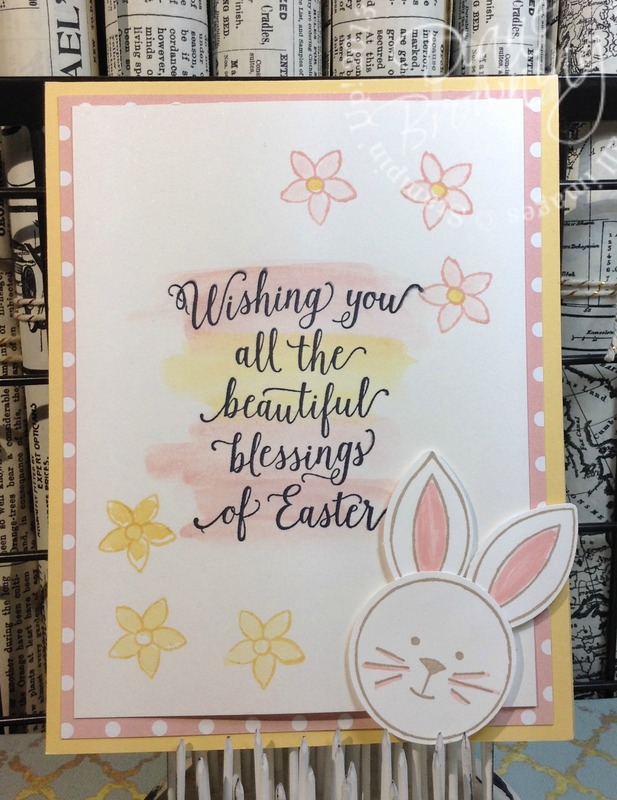 Last week at our Downline Meeting, we made this adorable card using the Friends and Flowers stamp set. This stamp set is all pieces that you can assemble into flowers or creatures. This is one set that I resisted purchasing. But after seeing what Chrissie can up with for our Make and Take last week, it’s getting harder and harder to resist! I love this cute and simple card. This card was really easy to put together. The flowers are stamped in both So Saffron and Pink Pirouette. Then colored in using a blender pen. The bunny face and ears are stamped and then punched out. The ears and whiskers are colored in using a Pink Pirouette marker. For the sentiment, you’ll stamp it first in the Archival Basic Black. Using the blender pen, you’ll pick up some Pink ink and color over the top and bottom of the sentiment. Then again with the blender pen, you’ll pick up some of the So Saffron ink and fill in the center of the sentiment. I love using the blender pen. It gives me a softer shade of the color. And if it’s not dark enough the first time, I can keep coloring right over the top. Check back Wednesday for another Easter project!